On Wednesday 13 May, 80 year old Gillian Burrell and her husband Roger attended their first Dementia Friendly Swimming session at Chester-le-Street Leisure Centre pool in Durham, where the new swimming initiative was recently launched. 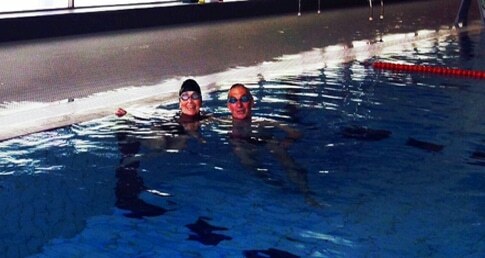 Once a champion butterfly swimmer in France, Gillian was formally diagnosed with Alzheimer’s disease in 2014, and despite this she continues to show incredible athletic ability. In January she won 1st place at the Euro Open Indoor Rowing Championships in Amsterdam and then went onto secure a 2nd place win in the over 70 category at the English Indoor Rowing Championships in March. While Gillian has continued to thrive in other areas of her sporting life however, husband Roger explains how dementia made swimming a challenge: “With indoor rowing competitions, I can be right next to her and talk her through things, but swimming is obviously very different. The Dementia Friendly Swimming project, which aims to enhance the swimming experience of those living with dementia and their carers, targets the pool environment while delivering low intensity exercise, relaxation sessions and structured motivational swimming lessons. For Roger and Gillian, the value of the sessions lie in their ability to generate public awareness of dementia, and create an environment that allows those living with the condition more freedom in the pool.